One of LA's most exciting meals of the moment is not where you think it would be. It's not in a huge, beautiful space that cost millions of dollars to build out in whatever trendy neighborhood is up-and-coming at the moment (is it still Highland Park? I can't keep track). It's not a highly-anticipated hotspot that's been on everyone's Monthly Must-Try List. Instead, one of LA's most exciting meals is located in a cozy dance-studio-turned-art-gallery you've never heard of on a nondescript section of Lankershim in NoHo. And if you don't believe me, that's ok, because I will use the rest of this post to try and convince you. When I first arrived at Intro Art Gallery and Chef's Table, I wasn't sure I had the address right. Surely, this deserted block was not where I was expected to eat a meal by Michelin-starred Executive Chef Paul Shoemaker. I could barely find the door, but when I did, I was immediately greeted with the friendly smile of Rob “Rob C” Ciancimino (one of the brilliant minds behind the operation) and a glass of champagne. Though I felt like I had just arrived at someone's beautiful home for an intimate dinner party, I knew then I must be in the right place. Along with Manny Marroquin, multi Grammy Award winning mixer/engineer and owner of the famed Larrabee Studios, this superstar trio has created a truly unique dining experience that combines art, music, and spectacular food. The best way I can describe the whole experience is simply special. 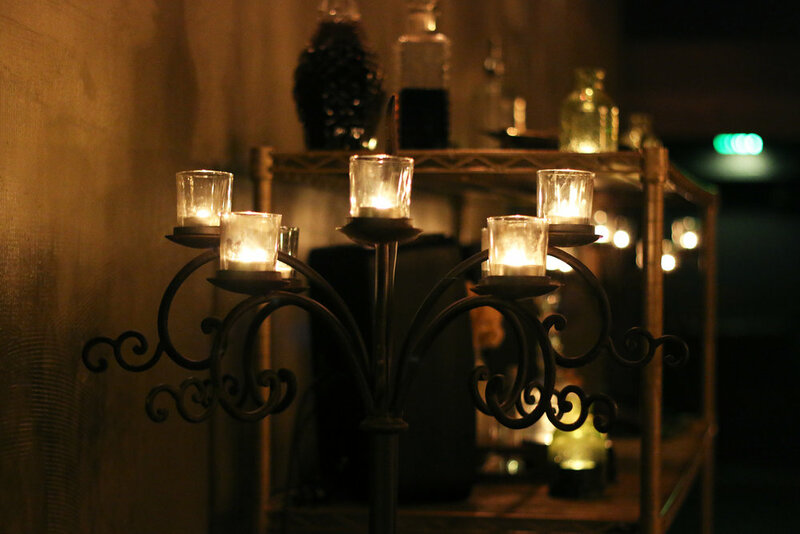 The intimate decor featured large, dripping candles, modern candelabras, natural elements, apothecary bottles, and modern art adorning the walls, immediately giving the space an upscale modern feel with a classic touch. A large communal table with around 20-30 seats takes up the middle of the room, but guests spend the first part of the evening drinking prosecco, walking around looking at art, nodding along to the upbeat music, and mingling. By the time we sat down for dinner, we were ready to eat. Needless to say, we were quite pleased to see that dinner would be a 12-course affair (which doesn't count the cocktail course and TWO amuse-bouches). They got us quickly boozed up with mini cocktail trio. The champagne strawberry fizz was like a sweet, boozy slushie with a layer of yogurt and chopped strawberries-- it could've been dessert. I unfortunately had to pass on the bourbon apple cider (I have bourbon problems), but the Cold Fever with gin and pomegranates was lovely. Refreshing and a bit sweet as well. After that, we slowly waded into the meal with our two amuses. The first (not pictured) was a salty salmon skin chicharon with smoked salmon roe, creme fraiche, and lemon gel. Though the flavors were familiar, I loved how they were executed in a fun and unexpected way. Next was a truffle combo, starting with a "dime bag" made of Japanese rice paper that you let melt on your tongue to reveal whipped truffle honey comb, butter cream, foie gras, cocoa nibs, and pine nuts. The crunchy pine nuts and cocoa nibs were a nice counterpoint to the creamy foie gras and sweet whipped truffle honey comb. It was a whimsical little bite, with plenty of satisfying flavors packed into a tiny vessel. Next, the truffle mac-daddy was similarly magical; a little truffle macaron dusted with silver on top, it was a lovely savory take on this typically sweet treat. So far, so good. Foie Gras and truffle seemed to be the themes of the night, as next up we had a Foie Gras Truffle Ravioli. As expected, it was incredibly delicious and decadent, as the parmiggiano reggiano espuma added a subtle cheesiness to the tender and fluffy raviolo. Despite the rich ingredients, I probably could've eaten a whole bowl as the Chef used the truffle and foie gras delicately, without hitting me over the head with them. Another bite that I definitely could've had more of, the Big Eye Tuna was a savory and flavor-packed departure from your typical tuna dish. The yuzu ponzu was savory and addicting, while the caviar, smoked sesame, and red shiso added layers of flavor that would hit me in different ways as I drank down the broth. Creamy, baked avocado was a welcome addition, lending the bite a rich, fattiness that cut through the yuzu ponzu's acid. The Peas and Carrots was one of the dishes that, to me, best sums up Chef Shoemaker's skill in combining familiar flavors and dishes into something new and exciting. Everyone knows what peas and carrots taste like, just as gnocchi is a very familiar pasta to many. But a gnocchi made from carrot juice pate choux is truly something I've never had, and while the carrot flavor was subtle in the soft, tender pasta, it was really good. With the added peas and carrot jus, the dish was comforting yet fresh and light. In a similar fashion, the lobster boasted familiar flavors-- like basil and lemon-- but in a creative medium, as the Chef presented these elements as flavor-packed "soil" that reminded me of a granita. The lobster itself was buttery and poached perfectly, while the basil and lemon provided pops of acid, herb, and citrus. Like the lobster, the scallop was cooked perfectly, with a beautiful sear on the outside and submerged in a frothy Époisses (cheese) fondue. Though I'm not a huge lover of Macadamia nuts, they did add a nice crunch to the dish. Along with macadamia nuts, beets are actually one of the few foods in the world that I don't love (but can tolerate), so obviously I was not thrilled with a whole plate of different preparations of beets. But surprisingly, the dish wasn't actually all that beet-y, despite the Chef's description of the dish was "beets gone wild." Though they came in candied, dehydrated, and marshmallow form, it was actually quite a sweet dish, with a bit of creamy tang from the whipped goat cheese. The candied walnuts added some crunch, while pickled blueberries gave the sweet dish a touch of acid. Overall, I actually really enjoyed the dish and ate all of it. Next up was a little sliver of cuddlefish in a sake lemongrass reduction with burdock root and pickled daikon radish. The cuddlefish was nicely cooked, while the burdock root and radish were nice elements. Getting into the more substantial portions of the evening, the pork belly was a really fun dish. The pork itself was tender and well-cooked, which proved a fun bite with the crispy pig skin on top. I really enjoyed the sweet, acidic honey poached cranberries as well as the bourbon aged maple. I loved that this was a slight departure from and seasonally appropriate take on a typical pork belly dish. To finish off the savory portion of the night, the chef treated us to some incredible dry-aged beef that was perfectly cooked and really well-seasoned. The sweet potato and burgundy truffle purées were subtle but flavorful backdrops for the tender meat, while the sauce vin rouge added just a bit of sweetness. Dessert was one of the most inventive portions of the meal, starting off with passion fruit (in a chewy, almost candy-like form) coated with 24k gold. Once the gold started to dissolve, the mineral flavor turned into something sweet and fun. The dead forest was a bit more hardy, with a crumbly combination of milk chocolate, salt, and brown butter. 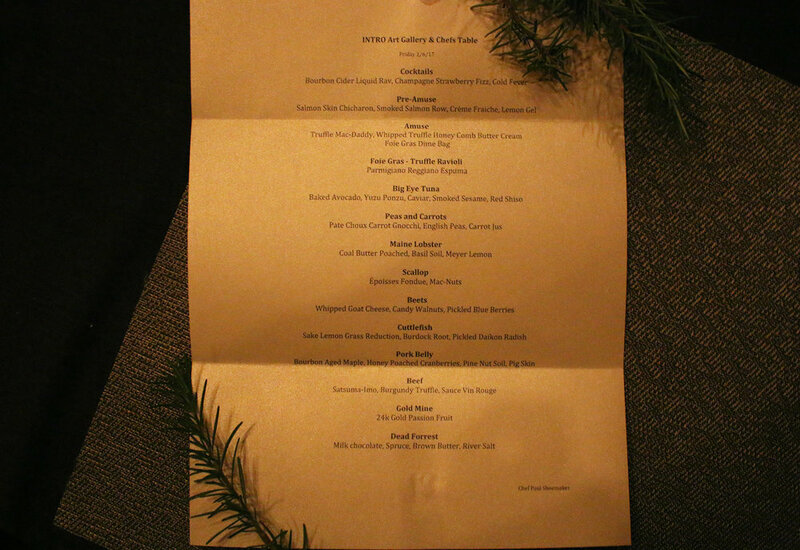 Overall, the meal was one of the most fun, creative, exciting, and unique experiences I've had of late. 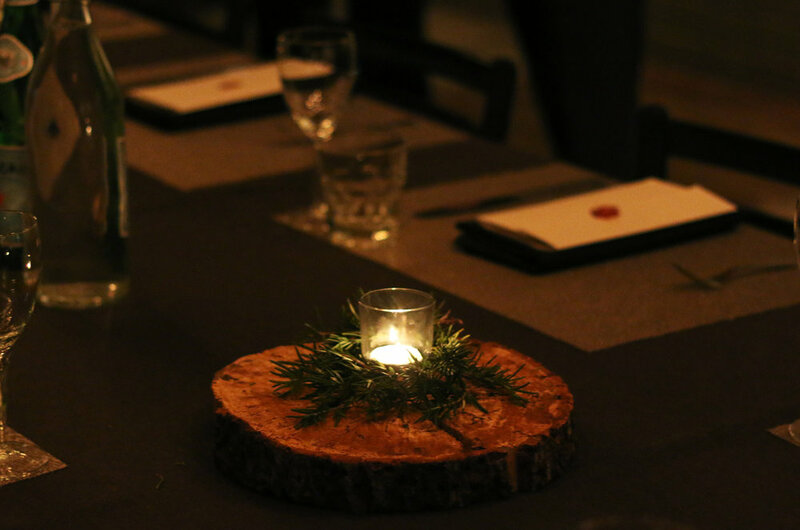 Intro's intimate setting and supper club structure is certainly a welcome departure from a traditional dining experience, and may be perfect for social butterflies open to making new friends over a 3-hour meal. And despite the upscale execution of each dish and the trendy decor, Chef Shoemaker's laid-back attitude (his tendency to casually describe a dish as "just some lobster" or "here's a bit of steak" belied his clear attention to detail and adept skill), the upbeat tunes, and Rob C's gracious hosting all aided in creating a special, friendly environment that nurtured each guest. When it comes to the food, the cooking, flavor combination, and presentation were some of the best I've experienced in awhile; the Chef managed to take familiar ingredients and flavors and transform them into something novel and whimsical, pushing diners out of their usual comfort zones without causing them to feel left behind by confusingly over-the-top dishes, excessively cerebral cuisine, or extremely unconventional ingredients (proving you don't need to serve live octopus just for creativity's sake). We're excited to see what this Michelin-starred Chef continues to create.